Musk and Moats … Is a Candy War in the Making? I couldn’t help myself. I had to weigh in on this. I assume you’ve kept up to date on the war of words between Elon Musk and Warren Buffett of late. If not, you should check it out. It’s amusing to say the least to see two multi-billionaires have at it over business strategy (Buffett was number 3 and Musk was number 46 on last year’s Bloomberg Billionaires Index, but who’s counting). It’s also thought-provoking. The controversy is all over the mainstream media. You can read more about it here, here and here. My take is somewhat different from most of the media’s coverage. Economic moats have been a mainstay of Buffett’s investment strategy for years, and it would be hard to argue that the strategy has not worked well for him. Musk’s choice of the words “quaint” and “vestigial” speaks volumes. His point is that, while moats may have worked in the past, the accelerated pace of disruptive technology today makes them relics. Is Musk right? Can a cogent argument be made that his point applies not only to technology companies but to old-line business as well … established companies (many of them with nice moats) that will be disrupted if they haven’t been already … and are likely in the midst of disruption as I write these words, even if they don’t see it staring them in the face? 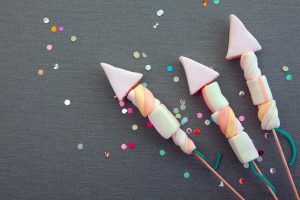 Buffett was referring to See’s Candy, a company he purchased in 1972 and whose moat, built in large part on a substantial and loyal customer base, he is rightfully proud of. And while he acknowledged that moats are more vulnerable and “susceptible to invasion” due to technological advancements, he stood firm in his conviction that the moat concept is still an important and viable business strategy, that strong companies do exist today as a result of the moats they have built, and that some companies’ moats have become even more impenetrable than they have ever been. He went on to cite Geico as an example of a strong company whose costs have not been lowered much by the technological advancements touted by Musk. Warren Buffett and his lesser-known partner, Charlie Munger, are investors, perhaps two of the greatest investors in my lifetime. They have the record to prove it. A $10,000 investment in Berkshire Hathaway in 1964 would be worth more than $240 million as of the end of 2017. That’s a return for the period 1964-2017 of over 2,400,000% (2,404,748% to be exact). Let that sink in for a moment. But it’s not just the total return over five decades that’s important. The following chart, courtesy of Marketwatch, shows yearly returns over the same period. With a few notable exceptions (for example, the early-2000s recession, the Great Recession of 2007-2009 and underperformance against the S&P in 2015) yearly returns in shareholder value have been consistently positive. And in most instances the large drops in market cap tracked the S&P; in other words, they resulted from market corrections, at the macro level as opposed to Berkshire Hathaway’s individual investment decisions. 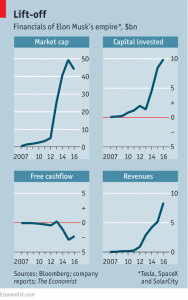 Buffett, like many other financial masterminds, pays close attention to free cash flow. 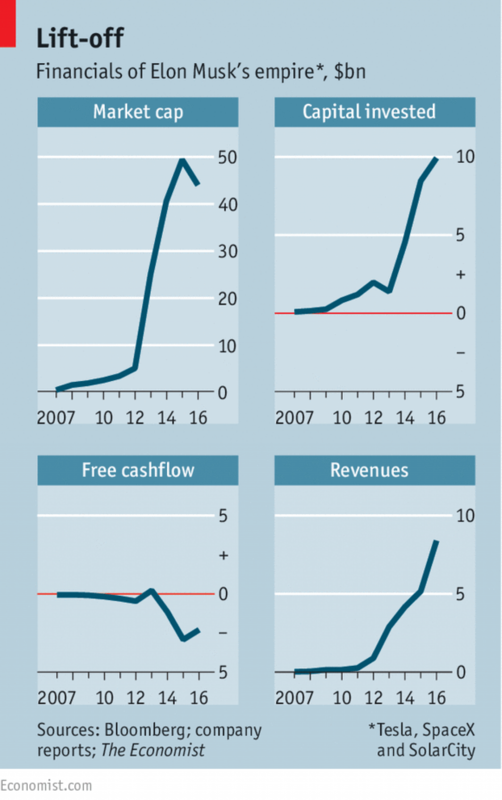 While he espouses a metric he describes as “owner’s earnings” (a measure of how much money can be returned to shareholders through dividends or share buybacks, or to invest or reduce debt) there is a direct parallel to free cash flow. The market cap of Musk’s “empire” (defined by The Economist as Tesla, SpaceX and SolarCity) has dropped by approximately 10% over a relatively short period of time (admittedly after a long, positive run). 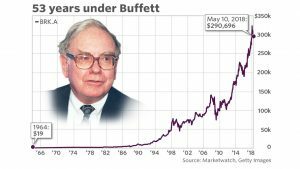 On the surface, you could argue that this is not that different from the market cap drops Buffett has experienced at various times during his leadership tenure at Berkshire Hathaway. However, there are several key differences. First, Musk has experienced these losses while at the same time racking up $10 billion in invested capital. Second (and directly correlating with the first point) his investments have bled cash to the extent that he has experienced multi-billion-dollar negative cash flows over a five-year period. And unlike almost all of those experienced by Buffett, these downturns and cash flow challenges have not tracked the market as a whole. Rather, they are the direct result of Musk’s decision to invest heavily in innovation for the long haul. Such a high-risk strategy, in the face of huge invested capital and negative cash flows, would not be tolerated very long by Buffett. Buffett is an investor. Musk is an entrepreneur. Buffett’s world centers on finance and owner’s earnings. Musk, on the other hand, has made no bones about the fact that he disdains finance. Buffett’s waking hours are surely consumed with making investment decisions that are directly accretive to the benefit of his shareholders (that is, of course, when he isn’t focused on playing bridge, his other passion). Musk’s passion, on the other hand, is for creating game-changing technological disruptions, even if at the expense of market cap and cash flow, in pursuit of a greater vision that hopefully will pay off in a big way. These are two very different mindsets, each of which has merit but neither of which can easily be reconciled with the other. There are a lot of naysayers out there who have not hesitated to voice skepticism as to the future of both Berkshire Hathaway and Musk’s various ventures. The headwinds are great for both Buffett (or, rather, his successor) and Musk. Buffett has said, himself, that he doubts Berkshire Hathaway’s successful run can be replicated going forward. Only time will tell what the future holds. Meanwhile, their respective strategies and decisions will be shaped by two disparate and seemingly irreconcilable world views. I can’t imagine a more striking contrast between two metaphors than that of moats vs moonshots. You could argue that the moat metaphor, harkening back to medieval visions of knights and castles, is an unfortunate one in the 21st Century, as it plays right into Musk’s use of the adjectives “quaint” and “vestigial.” But at the same time, it is an apt metaphor for Berkshire Hathaway’s portfolio … traditional companies in traditional industries with traditional business strategies … businesses that enjoy a defensive competitive advantage by virtue of price, management and customer base. Moonshots, on the other hand, are scary, fraught with risk and uncertainty. A moonshot has been defined as “an ambitious, exploratory and ground-breaking project undertaken without any expectation of near-term profitability or benefit and also, perhaps, without a full investigation of potential risks and benefits.” This is the most apt metaphor I can think of for Elon Musk’s portfolio of businesses. I have so much respect for Warren Buffett, for many reasons, and I will continue to embrace, at least for the foreseeable future, an investment strategy that has obviously been successful beyond imagination for Berkshire Hathaway’s shareholders. However, as an entrepreneur and someone who has written consistently about risk and disruption, I would put my money, at least for the long term, on Elon’s Musk’s entrepreneurial, risk-embracing business strategy … not necessarily on Musk’s specific ventures, but on a model that invests in the high-stakes game of disruption. Remember that failure is a critical component of moonshots, especially early on, and the likes of Tesla and SpaceX may or may not survive, but it is entrepreneurs like Elon Musk, those visionaries who are willing to stake all to pursue big dreams, who will change the game. Is there a middle ground? Can well-established companies successfully and sustainably combine a more traditional, cash-flow-rich component with an innovative, breakthrough line of business? Perhaps. The concept of intrepreneurship (sometimes referred to as corporate entrepreneurship), whereby larger, traditional companies integrate risk-taking and innovation into parts of the organization, has been around for years. My first exposure to the concept goes back to the early eighties, when I learned about Dupont’s efforts at corporate entrepreneurship. Some Fortune 500 companies have tried it without success. Others, such as Lockheed Martin, seem to have done a better job of integrating the traditional and the entrepreneurial (you can learn about Lockheed’s “Skunk Works” here). But it’s not easy, in large part because of the disparity in mindset, business model and rewards systems, and ingrained bureaucracy and rules-structures that get in the way, what has been referred to as the “Corporate Immune System”. Now, back for a moment to the candy war. Will Elon Musk start a candy company and “fill Warren’s moat with it?” Who knows. But if he does, rest assured that it will be a candy company unlike any you have ever seen. What are your thoughts? Please reach out and share them. And don’t forget to subscribe to my weekly newsletter, Something To Sleep On, which will arrive in your Inbox every Sunday. Each issue focuses on a particular theme and includes a quote, a thought-provoking question, a short article written by me and a link to an supporting article. All of these elements will work to reinforce the weekly theme and give you something to sleep on as you get ready to begin your workweek.